LEAP is a feature rich and flexible practice management kit that fuses core elements of legal practice management and accounting into a unified solution. Designed for small firms and solo practitioners, LEAP comes with a plethora of productivity tools to help them handle the non-lawyering side of things such as time tracking, automated document filing, billing, and accounting. Designed with the core idea to suit individuals, small or large teams, LEAP software is very user-friendly, and enables users to work smoothly and efficiently on a platform that integrates with their Microsoft productivity kit and Outlook accounts. Focused on helping small law firms move forward, LEAP has all the tools and capabilities you need to improve your brand’s reputation, make money out of your practice, and excel in it at the same time. LEAP is a revolutionary legal practice management suite equipped with all necessary features for practitioners to manage their cases and to establish good traction with their clients. The advanced capabilities such as matter management, document creation; import/export, and editing automate most of practitioners’ day-to-day tasks, cut time consumption and average expenses by as much as 30%; and most importantly – boost the good reputation and professionalism of their work. Once you become a LEAP user, you will automatically join a large community of experienced users, and get access to the company’s training blog with instructions, updates, and video tutorials. How does LEAP enhance and facilitate law practice management? This system fuses the best of legal practice and accounting capabilities on a single, comprehensive dashboard which doesn’t take time or effort to learn. It is completely cloud hosted and offers a unique hybrid app where information can be accessed both online and offline. LEAP is also popular for the variety of unique integrations, including QuickBooks Online (with a pre-billing guide that makes it possible for bookkeepers to operate out of the office), and LawPay which activates direct credit payments and trust-to-office transfers. At the same time, the company relies on its Zaliet partnership to please users with a fully designed, premium website where they can promote their services. All functions offered by this system are arranged in 5 comprehensive modules: Database Management; Legal content; Accounting; Mobile Apps; and Online Marketing. These modules are designed to accommodate as much information as the client has at stake, and well integrated with third-party technology to allow streamlined flow of their data. For example, the user gets a full list of US legal matters and ongoing/completed cases for each of them, where a single click can disclose all of the client’s information (Client Card), as well as correspondence that has so far been exchanged with him. Searching across different matters is also made easy, using some of the variety of advanced filters (content keywords, for instance), or following the internal calendar that notifies users on approaching deadlines. LEAP also supports statements of net worth and collates current regulations and legal rates for all US states, and thus eliminates all need to use third-party systems for financial calculations and compliance-related matters. Another functionality tab is dedicated to Forms and Templates, where the user can access all regularly updated legal document samples, create letters by simply inserting his details, letterheads, and signatures, or add any of LEAP’s custom fields while preparing a new, regular Word document. As expected, the system will empower him to email files directly to the recipient, print them, or export them in the desired format. 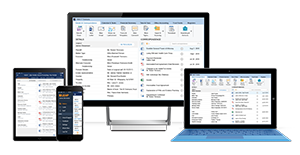 LEAP is the only law practice system directly integrated with Outlook and Microsoft Office, and one that supports personalized sharing via its LawConnect portal (free, secure, and without file size limitations). LEAP is also an effective legal billing system, where the user can track billing time, manage trust and client accounts, and capture any disbursement within seconds. Thanks to the pre-billing guide, users can immediately print off reports, generate and finalize their invoices, and email those to their customers. In the meanwhile, LEAP tracks and records every billable minute, regardless of whether you’re using your office computer or your mobile phone. Last, but not least, LEAP is distinguished for its collaborative nature, as it provides users with a smart notification system, neat task assignment, and complete screening of case history. You can pull off all types of financial summaries, and create both traditional and custom reports to keep a closer eye on your progress. If you are considering LEAP it could also be a good idea to analyze other subcategories of Best Law Practice Management Software gathered in our database of SaaS software reviews. Each company has its own characteristics, and can need a particular type of Law Practice Management Software solution that will be fit for their company size, type of clients and staff and even particular industry they cater to. You should not count on finding an ideal software that is going to work for each company regardless of their history is. It may be a good idea to read a few LEAP reviews first and even then you should pay attention to what the solution is intended to do for your company and your employees. Do you need an easy and intuitive service with only elementary features? Will you actually use the advanced functionalities required by pros and large enterprises? Are there any specific tools that are especially practical for the industry you work in? If you ask yourself these questions it is going to be much easier to get a trustworthy software that will match your budget. How Much Does LEAP Cost? LEAP is a quote-priced system, where each user receives a special package tailored to his needs. Contact the company for enterprise pricing, and ask for your quote. We realize that when you make a decision to buy Law Practice Management Software it’s important not only to see how experts evaluate it in their reviews, but also to find out if the real people and companies that buy it are actually satisfied with the product. That’s why we’ve created our behavior-based Customer Satisfaction Algorithm™ that gathers customer reviews, comments and LEAP reviews across a wide range of social media sites. The data is then presented in an easy to digest form showing how many people had positive and negative experience with LEAP. With that information at hand you should be equipped to make an informed buying decision that you won’t regret. What are LEAP pricing details? What integrations are available for LEAP? If you need more information about LEAP or you simply have a question let us know what you need and we’ll forward your request directly to the vendor.